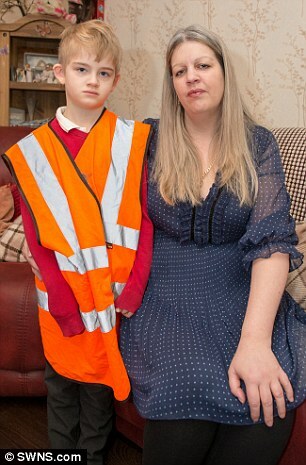 Joanne Logan has taken Cherry Lane Primary School to a disability tribunal after her son, Charlie, told her about the bib in February last year, reports the Daily Mirror. She cannot seek damages in the case, but hopes that it will help other parents raising kids with special needs. He was a Year 1 pupil at the school in West Drayton, London, which has almost 700 children. Ms Logan, a mother of five, told the Daily Mirror she hopes to win the case to help other parents in a similar position. 'I just want to make sure that no other autistic child needs to be put through what we did,' she said. Ms Logan previously said she was 'fuming' and described the school's actions as 'disgusting' and 'discrimination' when she found out about the bib in February last year. She said: 'It's just not right - it's massive discrimination. Looking back on it I think the classroom teacher mentioned a bib during the week - but I didn't really think about it, it didn't click until Charlie said something. 'But they seem to think the best way to deal with it is to make him wear a bib so that teachers know that he's autistic. She added: 'As far as I'm aware in the mainstream part of the school Charlie is the only child made to where a bib. Ms Logan had to wait until Tuesday before she could speak to the school's headmaster, Steve Whitehouse, about Charlie's situation. 'The bib is only for medical emergency so that dinner ladies can quickly see the children who need help. 'This is not something that is used as standard, it is a preventative measure used to identify if something happens. 'This was a decision with the parent, he had a number of problems with other children, the class teacher had spoken to his mother and suggested that the teacher take appropriate action. A Cherry Lane Primary School spokesman said that parents are 'always consulted' before actions are taken in regards to the needs of their children. 'Should a parent change their mind regarding our practice, we work with them accordingly', they said. Mrs Logan said there had been complaints about Charlie acting in a violent manner and hurting other children. Mrs Logan has discussed the problem with headmaster Steve Whitehouse. The decision was made not to make Charlie wear the jacket again. She has kept him off school for two days and is not sure what the next step will be. Her other three boys, Brendan, 18, Leighton, 16, and TJ, 12, have all been diagnosed on the autistic spectrum and she said she has resorted to legal action to force Hillingdon Borough Council to put them on an educational support plan.